After singer-songwriter Taylor Swift blasted Apple for not paying artists during the trial -- which launches June 30 as Apple Music debuts -- Apple executive Eddy Cue responded on Sunday, tweeting, "will pay artist for streaming, even during customer's free trial period." Apple Music will offer a three-month free trial, considerably longer than the typical 30-day trial that other paid streaming services provide. After the trial expires, individuals must pay $9.99 per month; a family plan for up to six members will run $14.99. Apple Music, unlike rivals like Spotify -- but like its forerunner, Beats Music -- will not have an ad-supported option. The quick switcheroo will cost Apple. But how much? According to an estimate by Aram Sinnreich, an associate professor at American University who researches the music industry and its transition to digital, Apple could pay out as little as $72 million over the first three months. Sinnreich based his calculation on some conservative guesses -- 100 million customers who each listen to an average of 100 tracks per week -- but based other variables on harder data. On average, said Sinnreich, artists under contract with a record label are supposed to be paid 60 cents for every 1,000 streams on an on-demand service like Spotify, or in this case, Apple Music. In decimal form, that's $0.0006, or six ten-thousandths of a cent per stream. 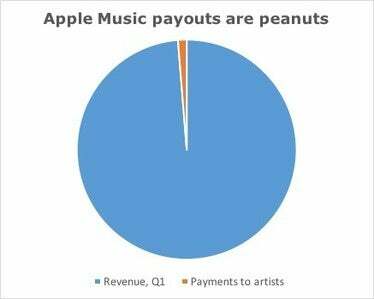 Even a high-end estimate of Apple's cost to compensate artists during the three months of free Apple Music trials is puny compared to the company's revenue during the quarter that ended March 31. Apple's cost for 100 million customers listening to 100 tracks each week for 12 weeks thus comes to about $72 million. Even if the number of Apple Music try-before-buyers doubled to 200 million, Apple's out-of-pocket would be just $144 million. To Apple, that's couch change: $72 million comes out as just over one-tenth of a percent of Apple's $58 billion in revenue in the March quarter ($144 million equals about two-and-a-half-tenths of a percent), or half of one percent of the company's $13.6 billion in net profit ($144 million equals just over 1% of the quarter's profit). Apple, of course, has even more in the bank, about $194 billion in cash as of the end of the March quarter. In other words, Apple can afford to kick money musicians' way. "Apple is so rich that this wouldn't even count on their bottom line," said Sinnreich. "Considering how central music is to Apple's overall consumer retention and monetization strategy, this is a small rounding error." Jan Dawson, chief analyst at Jackdaw Research, also covers the digital music industry, but he came up with a different number than Sinnreich. That wasn't a shock. "There are a lot of variables, a lot of wrinkles in any estimate," Dawson admitted up front before taking a stab. Dawson figured on a bigger uptake -- 250 million users -- primarily iPhone owners, who number about 450 million worldwide, and a less aggressive play, with an average of 200 tracks per month (compared to Sinnreich's 100 streams per week, or 400 each month). Where the two analysts' takes parted ways was remuneration. Dawson put it at half a cent per stream, a rough estimate he based on Spotify's outlays for both its paid subscriptions and its ad-supported side. The former compensates artists at a higher rate. Dawson's bottom line for Apple: about $750 million during the first three months. While that was more than 10 times Sinnreich's tally, it would still be small potatoes for Apple, amounting to 1.3% of the company's $58 billion revenue during the March quarter, or 5.5% of the $13.6 billion in net profit. "These are very rough back-of-the-envelope estimates," Sinnreich acknowledged. "But it's not a lot of money. That really needs emphasis. This is not about the money. This is not about the short-term money. This has nothing to do with this year, but about setting the terms of the relationship with the different stakeholders in the [music] distribution chain," Sinnreich said. For more information on streaming service payments to artists, steer towards a draft of a chapter from Sinnreich's forthcoming book [download PDF].